The University of Central Florida (UCF) is a flourishing university located in Orlando, Florida. With more than 64,000 students, UCF is one of the largest universities in the U.S and offers approximately 80 online degrees and certificates. UCF’s online learning program is substantial. Over 42% of the university’s annual credit hours are generated by online and blended modalities and over 81% of students take at least one online or blended course each year. "We are pushing the boundaries of how technology should work." IMS Global Learning Consortium, (imsglobal.org), is a non-profit, member collaborative that enables the adoption and impact of innovative learning technology. With 400+ member organizations, ideas for building an easy to use and efficient digital ecosystem are abundant. The Higher Education Playbook, created by institutional leaders of the IMS Global Higher Education (HED) Innovation Leadership Networks, helps institutions streamline the learning curve around open standards and create an integrated plug-and-play edtech ecosystem. The Playbook is designed to be an easy-to-use reference and resource center for academic and IT leaders, curriculum and education technologists, IT specialists, and development teams. From procurement resources to best practices and how to get started, the HED playbook offers a rich array of support resources for institutions wanting to develop a plug-and-play ecosystem. The basic use case behind the development of the LTI specification is to allow the seamless connection of web-based, externally hosted applications, and content, or tools to platforms that present them to users. In other words, an interactive assessment application or virtual chemistry lab can be securely connected to an educational platform in a standard way without having to develop and maintain custom integrations for each platform. A very popular LTI-enabled tool developed by the UCF team is the Universal Design Online content Inspection Tool, or UDOIT (pronounced, “You Do It”). This tool enables faculty to identify accessibility issues in their online courses. It will scan a course, generate a report, and provide resources on how to address common accessibility issues. CDL works with UCF’s Student Accessibility Services office to ensure access to online course content for students with disabilities. In the past, reviewing courses was an arduous process. With UCF’s large online presence, a systematic, proactive, instructor-centric approach was devised to identify accessibility issues in online course content. CDL applied for and won, a grant to build UDOIT. At the May 2017 Learning Impact Leadership Institute, UCF Center for Distributed Learning was selected out of 39 finalists to receive top honors for UDOIT in the global Learning Impact Awards competition. “The Learning Impact Awards designate the combination of a great product with a great strategy that together enables tangible advancement of access, affordability, and quality of educational programs," said Dr. Rob Abel, chief executive officer, IMS Global Learning Consortium. “These are very difficult awards to win, and we congratulate UCF for obtaining a platinum medal for 2017." Each year IMS Global publishes the annual Learning Impact Report to capture the insights from the current year’s award winners. The 2017 report will be released in the fall. Other tools have been developed as a direct result of feedback from the Instructional Design Team and faculty. Cavanagh states, “The governance process for what our CDL team should build is driven by the board that Shea Silverman co-chairs. Faculty make requests for what they need and want. This process ensures that our faculty feels empowered to ask for new features and to solve pain points that they may be experiencing.” For instance, when students needed more time on assessments, instructors had to go into each individual assessment and then each individual student assigned to that assessment to make the necessary changes. For courses with an enrollment in excess of 100 students, this accommodation was an arduous task. As a result, UCF developed the quiz extensions tool leveraging the LTI standard to allow for doing batch processes to update this information for all course quizzes and tests. ProctorHub is a tool that was designed to assist in verifying who takes an assessment and uses a web camera to track who is actually taking an assessment throughout the time the assessment is in progress. Another tool allows a user to search the UCF Libraries database for full-text articles without having to leave the learning management system. The link to the article can be added directly into the course for students and then the students access the link without ever leaving the course as well. And sometimes tools are built as new services and applications become available. When UCF adopted a different video streaming platform, rather than requiring instructors to go in and migrate videos from one service to another and then relink those videos into the course, the development team created an LTI tool that allowed instructors to do the work in just a few clicks. One of the most recent projects that the team is developing is a student performance dashboard. The dashboard is intended to help students see their current scores, individual performance, and overall comparison (data is anonymized) to other students in the course. Students use sliders to plan their performance on upcoming assignments. Teachers can see the same information for all students in their courses and get insight into what activities correlate most with student success. What does the future look like for the Center for Distributed Learning? Cavanagh foresees more customization in platforms. 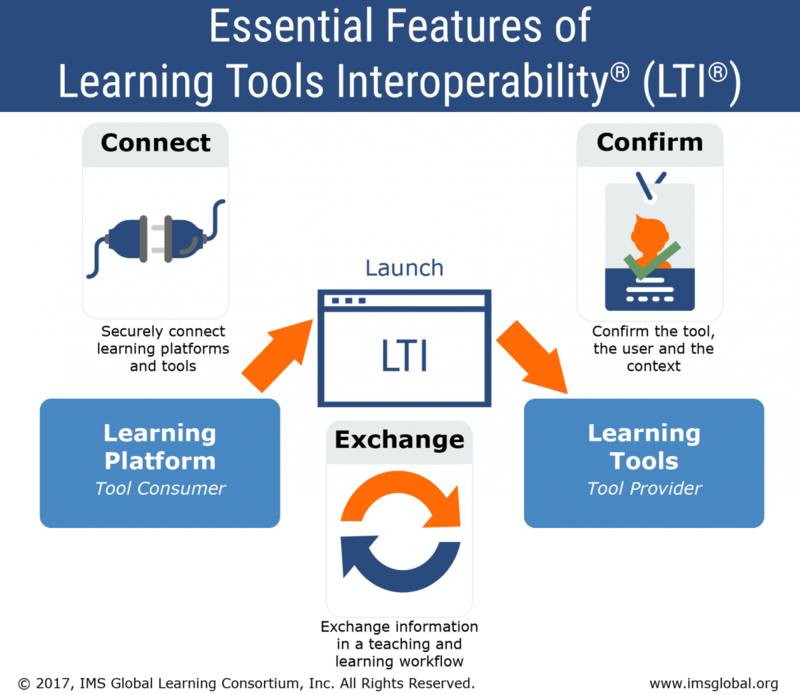 “We are on the early edge of the ways in which we can use LTI now. The future of education that many refer to as the next generation digital learning environment will have interoperability as a key characteristic and LTI will become even more of a norm for applications that plug into the platform,” he envisions. Yonekura says, “We are pushing the boundaries of how technology should work. Interoperability of data will increasingly allow us to inform the future of LTI.” Indeed, the future for students, faculty, and staff at UCF is bright thanks to the visionary work of the Center for Distributed Learning.